Bambi. A Life in Woods. New York: Simon and Schuster, 1928. ￥69,000 (税込み) 20.5 x 14 cm. First America edition. 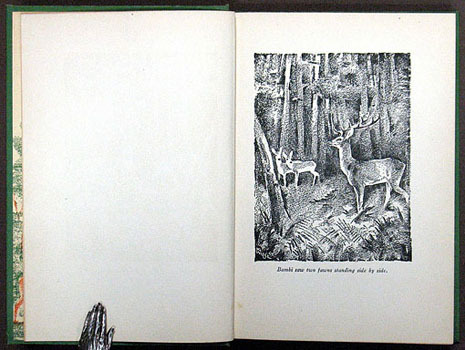 293 pp., with 26 black and white full-page illustrations by Wiese Kurt. Original green cloth, lettered in gilt, gilt darkened, spine slightly curled, with original d.j. slightly soiled and browned, some internal tears repaied.